Ballyhalbert (formerly known as Talbotston and Halbertston) is a small village and townland in County Down, Northern Ireland. It is on the east (Irish Sea) coast of the Ards Peninsula between Ballywalter and Portavogie. In the 2001 Census it had a population of 447 people. It is largely residential and has a small harbour and large caravan site which was formerly a Royal Air Force (RAF) airfield, RAF Ballyhalbert, during World War II. It is within the Ards and North Down Borough. It had a population of 1,026 people (407 households) in the 2011 Census. The easternmost settlement of Ireland, Burr Point, is within Ballyhalbert's environs. 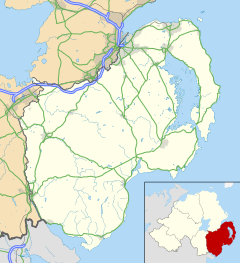 Ballyhalbert was originally known as Talbotyston as far back as 1333; however by 1605 it had been Gaelicised as Ballitalbot, and as Ballihalbert by 1617. The modern Irish name is Baile Thalbóid. The Talbot family settled in the area following the Norman invasion of Ireland in the 12th century. The Talbots came from Herefordshire in England, and also settled in County Antrim and County Dublin. The parish paid tithes to Black Abbey in 1615. In 1659 there were 12 English/Scots and 10 Roman Catholic families. There is an ancient Anglo-Norman motte just behind the village. In 1836 it was described as being without any importance and not being a post town. The inhabitants were mostly fishermen and other trades were 4 spirit dealers and grocers and one smith. I t had 45 cabins, 18 of which were slated and 11 two-storey houses of stone with small windows. There were no fairs or markets held in the village. The people were described as respectable and industrious with no decided cleanliness about them or their houses. They used turf as fuel for their fires. There was a court held in the village every 9 weeks and a leet court held every year in April. There was no police constable, but there were 8 coastguard men and one chief officer. There were two corn mills here in 1836, an ancient standing stone nearby and a village graveyard. On 27 May 1848 a public works program was instigated for famine relief with the upgrading of the road from Portaferry to Ballyhalbert. There was a Coastguard Station here in 1863. In May 1917 four vessels, the Saint Mungo, Derrymore, Amber and the Morion, were captured and sunk in Ballyhalbert Bay, by U-boat UC 65 under the command of Otto Steinbrinck, one of the most famous U-boat commanders of World War I. The village played a major role during World War II when an RAF airfield, RAF Ballyhalbert, was built. It had the important role of protecting Belfast and the eastern half of Northern Ireland. During its lifetime, Ballyhalbert was home to RAF, Army, Navy and United States Army Air Forces (USAAF) personnel. The airfield was sold to developers in March 1960, and is in use for several popular caravan parks. Victoria Primary School serves the area. ^ a b Ulster Scots Agency, page 19. ^ "Ballyhalbert". Census 2011 Results. NI Statistics and Research Agency. Retrieved 22 April 2015. ^ "Ballyhalbert History - The Talbots". Ballyhalbert website. Archived from the original on 5 October 2009. Retrieved 25 February 2009. ^ "Ballyhalbert Village". Ros Davies' Co. Down, Northern Ireland Genealogy Research Site. Archived from the original on 31 March 2009. Retrieved 25 February 2009. ^ O'Sullivan, Aidan & Breen, Colin (2007). Maritime Ireland. An Archaeology of Coastal Communities. Stroud: Tempus. p. 232. ISBN 978-0-7524-2509-2. Wikimedia Commons has media related to Ballyhalbert.